Selection for the post of Staff & Welfare Inspector in Level 6 of 7 CPC Matrix - General selection. Crediting arrears of Bonus for 2014-15 and Bonus for 2015-16 into employee’s PF account. Issue of Office Orders as soft copy through email for Technical Supervisors of Mechanical Department. Confirmation of IRSME Probationers - 2007 Batch. Selection for the post of Publicity Inspector(UR) in Level 5 RSRP 2016(Rs.5200-20200+2800GP-pre-revised) in publicity Branch /GM’s Office. ICF Employees Holiday Camp to GOA from 23.09.2016 to 28.09.2016. All India Essay Competition,2016 for Wards of Railwaymen. All India Drawing & Painting Competition for Wards of Railwaymen,2016. Festival Advance - 7th CPC recommendations. 50% Promotions Quota - Tech Gr.-3 - Trade-wise list. Observance of "Sadbhavana Diwas" on 20th August 2016. Selection for the post of JE/WS/Mechl in pay band Rs.9300-34800+4200 GP against 25% Promotional Quota - Issue of Alert Notice. Selection to the post of Office Supdt in pay band Rs.9300-34800 + 4200 GP against LDCE Quota. Cancellation of Chief law Assistant in pay band Rs.9300-34800 + 4600 G.P against 60% Promotional Quota-General selection. Appointment on deputation basis to fill up various posts in Central Vigilance Commission, New Delhi-reg. Implementation of 7th CPC recommendations - Statement of fixation of pay. 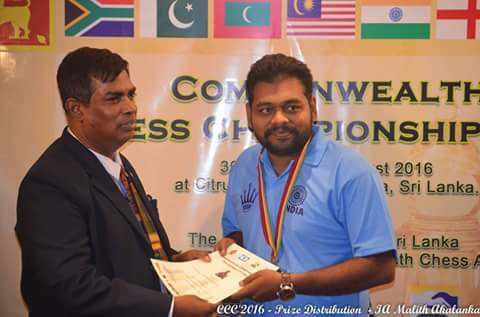 J.Deepan Chakravarthy of ICF won Bronze medal in Commonwealth Chess Championship held at Srilanka. Session on "Energy Saving Techniques and Electrical Safety" by TANGEDGO. Lateral Transfer from the erstwhile Gr.D cadres as Helper in Pay Band Rs.5200-20200 + 1800 GP.